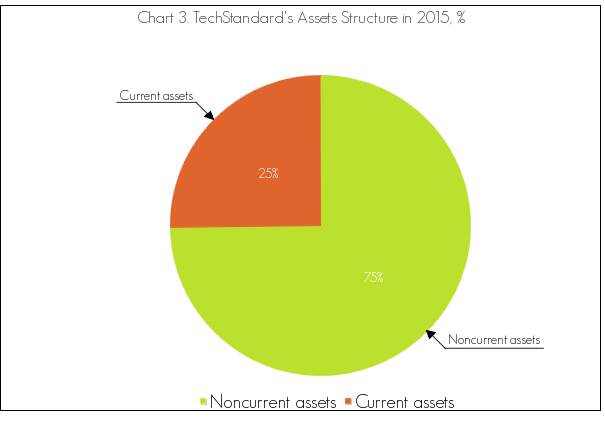 This report analyzes the balance sheets and income statements of TechStandard. Trends for the major balance sheet and income statement items and ratio analysis are used to understand the financial position and financial effectiveness of the company. The report studied the 2013 - 2015 period. It can be noticed from Table 1 that there was a tendency to decrease in the total value of the assets by 9.75% in 2014, but in 2015 the value of the assets grew by 4.2%. The value of the assets in 2015 totalled USD 125,496 thousand at the end of 2015. Overall, the value of the assets dropped by 5.96%. It reflects both a reduction in the noncurrent assets by 5.75% and a reduction in the current assets by 6.58%. Similar to the value of total assets, the liabilities and equity value amounted to USD 125,496 thousand in 2015, 5.96% less than in 2013. The stockholders' equity value was unstable in 2013-2015. This is an evidence of unsatisfactory financial situation and operational process. At the end of 2013 the assets consisted of 74.55% noncurrent assets and 25.45% current assets. The most significant items of the current assets were current inventories (6.87% of total assets), trade and other current receivables (10.09% of total assets), cash and cash equivalents (5.58% of total assets), etc. The following noncurrent assets had the highest values: property, plant and equipment (21.3% of total assets), goodwill (25.9% of total assets), intangible assets other than goodwill (14.84% of total assets), investments in subsidiaries, joint ventures and associates (6.48% of total assets), other noncurrent assets (4.4% of total assets), while the other items did not play a significant role. Over the period under review the assets structure changed. At the end of 2015 the assets consisted of 74.72% noncurrent assets and 25.28% current assets. Total current assets composed mostly of current inventories (6.97% of total assets), trade and other current receivables (10.08% of total assets), cash and cash equivalents (5.49% of total assets), etc. The most significant items of the noncurrent assets were property, plant and equipment (21.79% of total assets), goodwill (25.86% of total assets), intangible assets other than goodwill (12.06% of total assets), investments in subsidiaries, joint ventures and associates (8.7% of total assets), other noncurrent assets (4.25% of total assets), etc. By looking at Table 4 it can be noticed that the sources of finance consisted of 53.87% shareholders' equity, 21.48% noncurrent liabilities and 24.65% current liabilities. The average share of the equity in 2013 means the financial risk level is acceptable. The total equity consisted mostly of retained earnings (USD 69,808 thousand), etc. The company's liabilities included noncurrent provisions for employee benefits (6.06% of the total sources of finance), other noncurrent liabilities (10.67% of the total sources of finance), trade and other current payables (13.07% of the total sources of finance), other current liabilities (10.12% of the total sources of finance), etc. At the end of 2015 the sources of finance comprised 52.97% shareholders' equity, 20.32% noncurrent liabilities and 26.71% current liabilities. This shows that the share of the equity was in the area of critical values, meaning that the financial risk level was average. The total equity consisted mostly of retained earnings (USD 64,532 thousand), etc. The following liabilities had the highest values: noncurrent provisions for employee benefits (5.61% of the total sources of finance), other noncurrent liabilities (10.09% of the total sources of finance), trade and other current payables (12.34% of the total sources of finance), other current liabilities (12.88% of the total sources of finance), etc. The times interest earned ratio indicates that TechStandard had no difficulty generating enough cash flow to pay interest on its debt at the end of 2015. 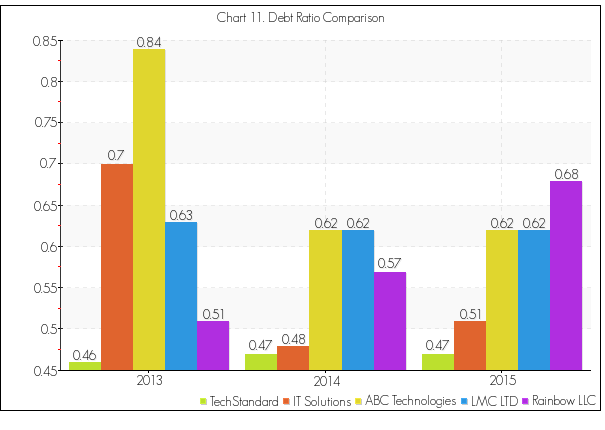 Company's ability to pay interest on debt was better in 2015 comparing to 2013. The debt ratio tells us that in 2013 each USD 1.00 of the assets was financed by USD 0.46 of debt (and USD 0.54 of equity). In 2014 47.02% of the sources of finance were liabilities. For every USD 1.00 of the assets there were USD 0.47 of liabilities at the end of 2015. The debt ratio lies in the area of critical values (from 0.4 to 0.6) at the end of the period, meaning that there was an acceptable financial and credit risk. The share of the long-term debt was unstable in 2013-2015. 20% of the sources of finance were a long-term debt at the end of 2015. The value of the long-term debt to total capitalization ratio was 0.99 at the end of 2013, 0.99 in 2014 and 0.99 in 2015. Total capitalization consists of the long-term debt, preferred stock, and common stockholders' equity. Lower ratio shows lower risk. The debt/equity ratio is another computation that determines the entity's long-term debt-paying ability. At the end of 2015 this ratio was 89%, meaning that creditors were protected in case of insolvency. The debt to tangible net worth ratio is a more conservative ratio than the debt/equity ratio. It eliminates intangible assets because they do not provide resources to pay creditors. The table 5 shows that the ratio changed from 3.51 in 2013 to 3.13 in 2015. This shows that the creditors' protection was getting better. The value of the long-term debt to equity ratio was 89.04 at the end of 2013, 72.63 in 2014 and 79.19 in 2015. 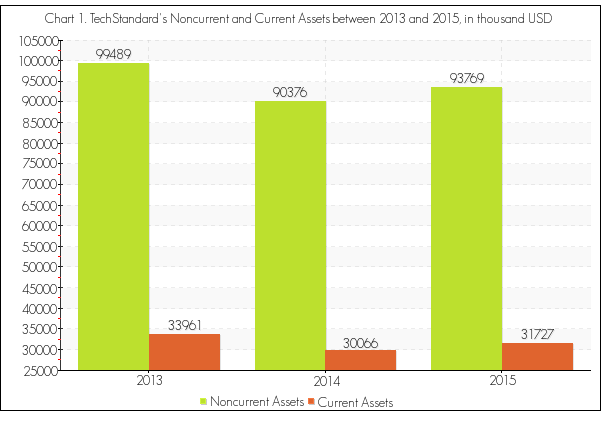 The current ratio was 1.03 in 2013, meaning that TechStandard had 1.03 times as many current assets as current liabilities. The value of the ratio lies below the area of critical values. The current ratio was 0.9 at the end of 2014 and 0.95 at the end of 2015. The value of the ratio was unacceptable at the end of the period under review. This means that TechStandard had problems with paying its suppliers and creditors in due time. The quick ratio for 2013 was 0.64, showing there were USD 0.64 of the quick assets for every USD 1.00 of the current liabilities. The ratio for 2015 from Table 6 shows USD 0.58 of the quick assets were available for every USD 1.00 of the current liabilities. It can be seen that the liquidity of the enterprise was varied by different time periods. The cash ratio shows that the company was able to pay off 20.57% of its debt immediately as for the end of 2015. The value of the ratio lies above the area of critical values. 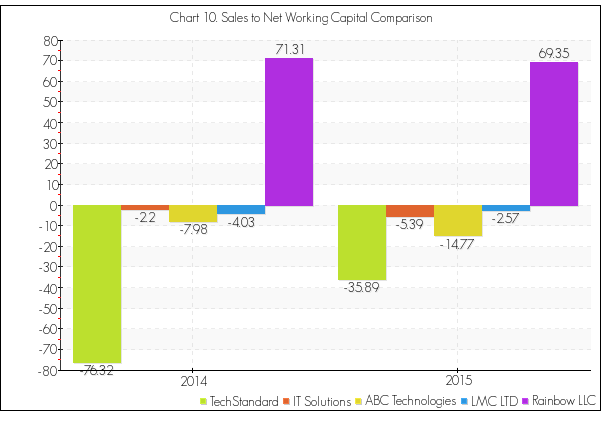 Table 6 presents the working capital for TechStandard at the end of 2013-2015. TechStandard had USD 1,066 thousand in the working capital in 2013, USD -3,481 thousand in the working capital in 2014 and USD -1,795 thousand in the working capital in 2015. Overall, the value of the working capital had dropped over 2013-2015. The sales to working capital ratio increased from 2014 to 2015. This indicates a more profitable use of the working capital in 2015 in relation to 2014. The comparative income statement given above shows there has been an increase in the net sales of 3.34% over the reported period. The cost of goods and services totalled USD 48,111 thousand in 2014, 1.17% more than in 2013. At the end of 2015 the cost of goods and services totalled USD 49,364 thousand. This has resulted in an increase in the gross profit by 2.83%. EBIT was positive at USD 13,604 thousand in 2015. The EBIT growth was 23% during 2013-2015. On the whole, 2015 was a good period as the company recorded USD 15,179 thousand comprehensive income. 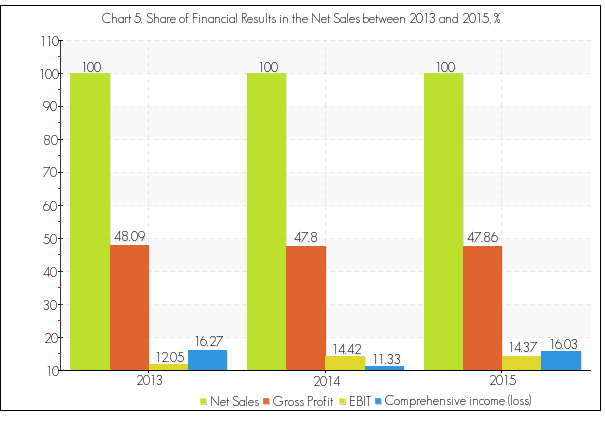 The chart above shows that the gross profit to net sales ratio decreased in 2014 by 0.3% comparing to 2013. This was followed by the increase of this ratio to 47.86% in 2015. The dynamics of the gross profit to net sales ratio over the period of 2013-2015 demonstrate that the company's manufacturing or distribution process management efficiency was changing from period to period, being better during the periods with higher values of the ratio. 2014 also witnessed the increase of the company's EBIT to sales ratio comparing to 2013. Changes in dynamics of the company's EBIT to net sales ratio over the period of 2013-2015 confirm the variability of its cost management efficiency and earning ability. Periods with higher values of this ratio witness better performance of a company in terms of profitability and cost management. The share of the comprehensive income in the company's net sales decreased in 2014 by 4.94%. By looking at Table 8. 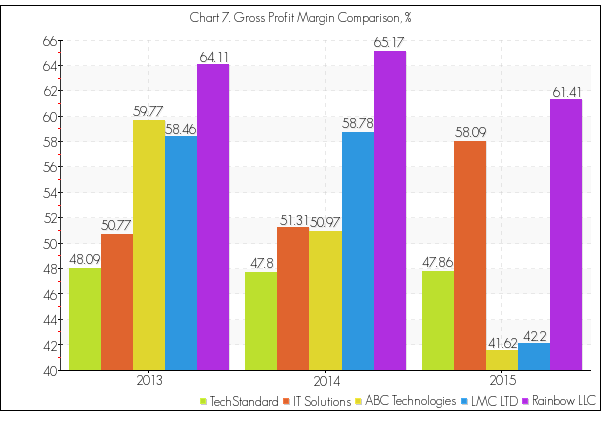 'Profitability Ratios' it can be seen that the net profit margin was positive in 2013-2015. At the end of 2013 for every dollar of the net sales collected TechStandard kept USD 0.08 as profit. In 2014 the net profit margin was 0.1 (9.96%). This amount reached 0.1 (10.14%) in 2015. 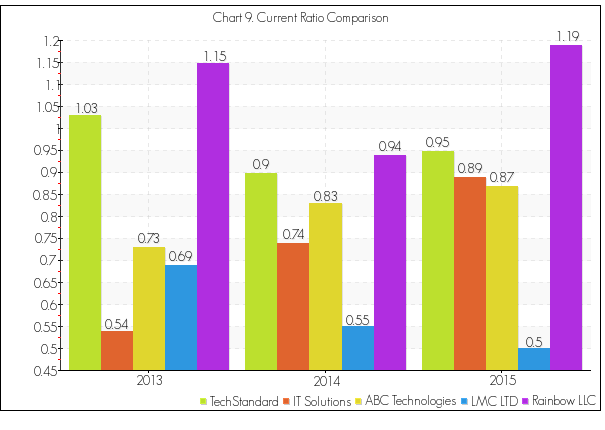 The TechStandard's operating performance was robust in 2015. For every dollar of the net sales the company earned USD 0.14 in the operating income. Gross profit margin shows that the company earned USD 0.48 of the gross profit per dollar of sales in 2015. Cost of goods sold increased much more than sales, resulting in a lower gross margin in 2015 comparing to 2013. For TechStandard the ROA shows that the company was earning a profit of about 7.81 cents per dollar of the asset value in 2015. The operating assets were yielding a 18.99% return in 2014. This ratio was 0.56% higher at the end of 2015. Higher ROIs suggest better performance. Overall, ROI improved from 10.66% in 2014 to 11.72% in 2015. Company's return on assets increased from 7.23 in 2014 to 7.81 in 2015. The explanation for this trend can be found, as both net profit margin and total asset turnover grew in 2015 comparing to 2014. Net profit margin an increased from 9.96 in 2014 to 10.14 in 2015, indicating the amount of the net profit generated by 1 dollar of sales became greater. Total asset turnover grew from 0.73 in 2014 to 0.77 in 2015, meaning the company has been increasing the efficiency of managing its assets, turning them over more frequently. By looking at Table 10 it can be seen that the company produced USD 0.77 of products and services for every dollar of the assets used at the end of the period. The total asset turnover ratio was higher in the second half of the period under review because the net sales of the enterprise increased and the average total assets decreased in 2014-2015. The fixed assets turned over 3.33 times in 2014 and 3.49 times in 2015. Within one period, on average, the current assets are turned over at least 2 times. It can be seen that the working capital turnover was -76.32 in 2014 and -35.89 in 2015. The 2014 accounts receivable turnover of 7.18 indicates TechStandard collected its average receivables 7.18 times that period. The higher the turnover is, the faster the collection process. Each dollar invested in the accounts receivable generated USD 7.62 in sales in 2015. As a result, the average collection period dropped from 50.13 days to 47.26 days. This means that it took an average of 47.26 days to collect a receivable in 2015. The accounts payable turned over 2.87 times in 2014 and 3.13 times in 2015. The turnover of the accounts payable was reduced from 125.37 days to 115.06 days. By comparing the turnover data of the accounts receivable and accounts payable during 2015 it can be seen the accounts receivable were turned over faster than the accounts payable. 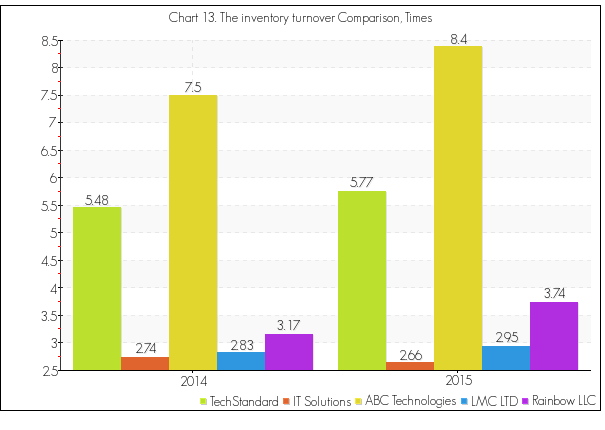 TechStandard's inventory was more active in 2015 than in 2014. The company was holding the inventory almost a 3.24 day(s) less in 2015 than in 2014. The cash turnover ratio was 13.3 in 2014 and 14.23 in 2015. It took the company 115.8 days from a moment of buying inventories until getting cash for selling goods and services in 2014. The operating cycle was 109.7 in 2015. Shorter operating cycle indicates better performance. The cash conversion cycle shows how long does it take a company to convert the resource inputs into cash flows. The negative value of the cash conversion cycle demonstrates problems in paying off debt to suppliers in due time. The net value of the enterprise's assets was USD 66,475 thousand at the end of 2015, about USD 2,336 thousand more than declared at the end of 2014. But company's net value change was negative in 2013-2014. Unstable growth is an evidence of unsatisfactory financial situation and operational process. If earnings before interest increase, the financial leverage will be favorable. The degree of financial leverage was 1.07 in 2015. This means that any change in the EBIT will be accompanied by 1.07 times that change in the net income. This is a low degree of financial leverage. TechStandard was in the gray area between 1.20 and 2.90 in 2013. The Altman Z-score for 2014 shows an average bankruptcy risk. At the end of 2015 the Altman Z-score was 1.99 (within the gray area). The increase of the company's Z-Score value over the period of 2013-2015 showed that TechStandard has been improving its financial condition and declining the risk of bankruptcy. It also witnessed that the company did not perform well enough to move its Z-Score value to the safe area, and so it stayed within the gray area in 2015. 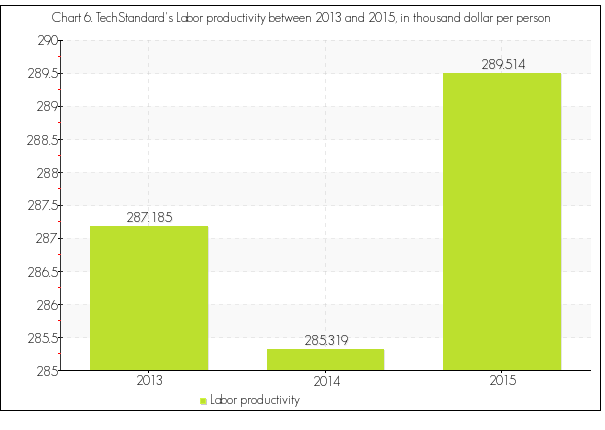 In TechStandard productivity improved from 2013 to 2014, but decreased in 2015. Productivity changed by 0.81% over the period under review. As a result we can confirm a satisfactory (B) financial situation. Different industry variables create the unique financial conditions, in which the company is currently working. This is why a comparison with the major competitors helps to get a precise estimation of the TechStandard's financial position and effectiveness. TechStandard had 13.56% worse result than Rainbow LLC, but 6.24% better result than ABC Technologies in 2015. 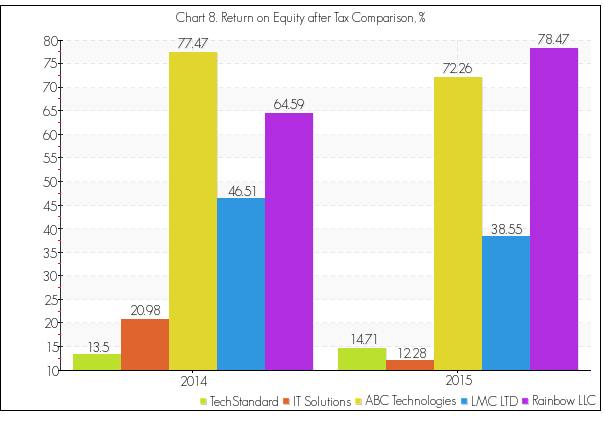 Equity utilization was more effective in TechStandard (14.71%) comparing to ABC Technologies (12.28%), but less effective comparing to Rainbow LLC (78.47%) in 2015. TechStandard shows lower ability to pay it's short-term debt comparing to , but better liquidity comparing to . Company had 0.95 of current assets for every dollar of current liabilities. 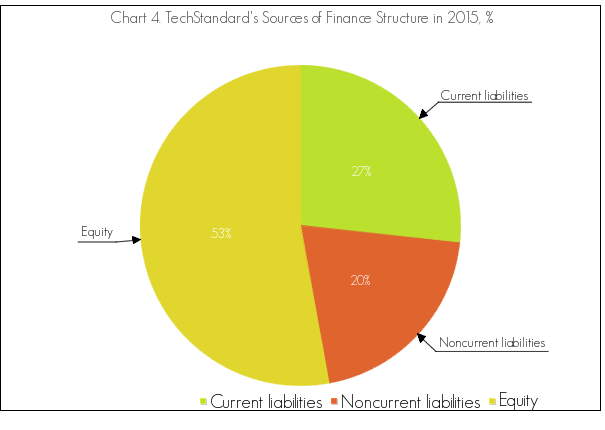 47.03% of TechStandard's sources of finance were liabilities in 2015. This reflects the lowest dependence of TechStandard from the external sources of finance among the major competitors. If any unpredictable financial turmoil happens (in the industry or in the financial market), TechStandard will be the last to meet problems with the attraction of financial resources or refinancing current loans. TechStandard has -0.54 worst result than Rainbow LLC, but 0.45 better result than ABC Technologies in 2015. 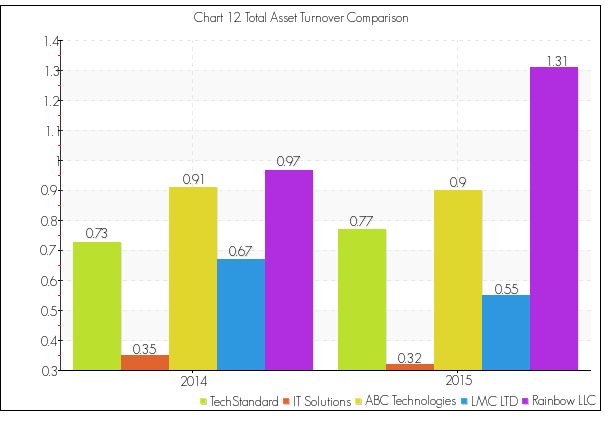 The inventory management was the most efficient in Rainbow LLC and the least effective in ABC Technologies in 2015. The inventory turnover for TechStandard equaled 5.77 times per 2015. - TechStandard's financial sustainability ratios indicate good financial health at the end of 2015. This company was able to generate enough cash flow to pay interest on its debt while the debt ratio laid in the area of critical values (from 0.4 to 0.6). 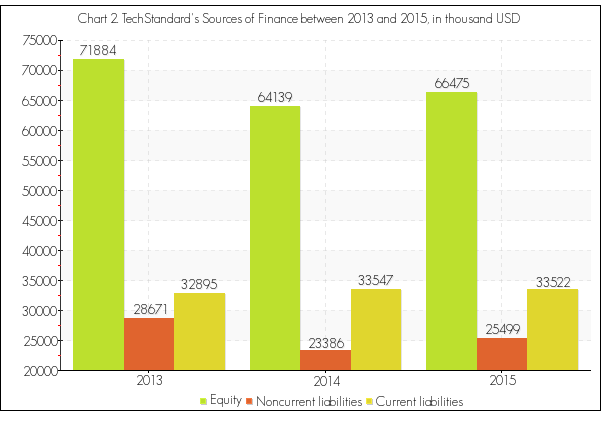 - TechStandard's liquidity ratios demonstrate a short-term issue in 2015. It was able to pay off the most urgent debt, but the current ratio and the quick ratio were unsatisfactory. - The positive profitability provides evidence of a good financial position at the end of 2015. The ROA shows that the company was earning a profit of about 7.81 cents per dollar of the asset value. The return on equity after tax was 15%. - The total asset turnover ratio was getting higher because the net sales of the enterprise increased and the average total assets decreased in 2014-2015. An average accounts receivable collection period dropped from 50.13 days to 47.26 days. This means that it took an average of 47.26 days to collect a receivable in 2015. Comparing the turnover data of the accounts receivable and accounts payable during 2015 it can be seen that the accounts receivable were turned over faster than the accounts payable. - The net value of the enterprise's assets was USD 66,475 thousand at the end of 2015, about USD 2,336 thousand more than declared at the end of 2014. However, the company's net value change was negative in 2013-2014. Unstable growth is an evidence of unsatisfactory financial situation and operational process. - At the end of 2015 the Altman Z-score was 1.99 (within the gray area). - The overall financial position of the company was satisfactory (B).